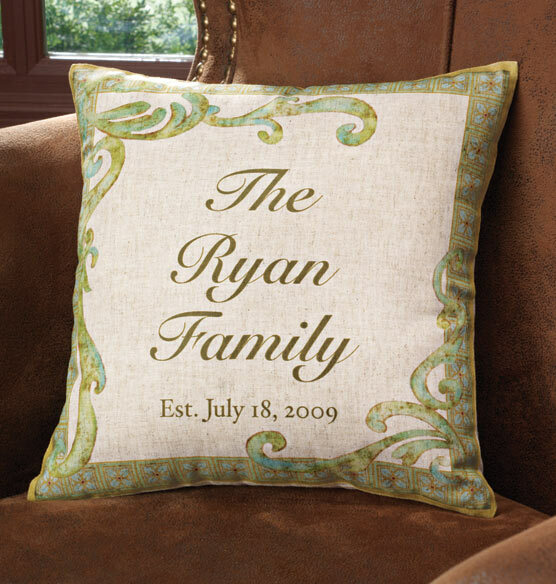 Create a stylish personalized gift with this classic linen pillow. The versatile style complements any decor. Natural linen fabric with a neutral green scrolling pattern adds a soft touch that’s equally at home in traditional or modern settings. Add a family name or special message to make it a gift they’ll treasure. Cover zips off for easy removal. Perfect housewarming gift idea. A perfect personalizd gift for many occasions. This pillow personalized with the couples' name and wedding date is stylish and fits in with todays' couples who personalize so many wedding items. Less than two weeks delivery. The pillow is light, zipper for easy removal for cleaning and perfect size for bed or chair.